Display a Stop Activity button on all pages of each activity the student plays. Set up auto-capitalize and auto speech properties. These settings will permanently stay in effect whenever and wherever the student plays an activity. Interface settings are changed through the User Settings dialog. 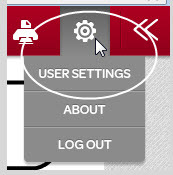 There are two ways you can access the User Settings dialog - through the Edit link on the student profile and from the toolbar of any activity that the student is currently playing in the Boardmaker Student Center. Note: If you have a Personal subscription, you must change user settings from the Student Center (see below). 4. Select the Interface tab to customize the interface settings for all activities played. Note: If you have an Individual subscription, you must change user settings from the Student Center. You can hide the Toolbar so it is not visible to the student, or you can password protect it so that the student cannot change any settings. If you password protect the Toolbar, the student will be able to open it, but he or she will not be able to access user or project settings. Note: To access the settings, the student must enter your instructor password (not his or her login password). You have the option of placing a "Stop Activity" button on each page of the activities the student plays. When the button is selected, a dialog will open asking the student to confirm that he or she wants to exit the activity. Always - Displays a Stop Activity button on each page of all the activities the student plays. 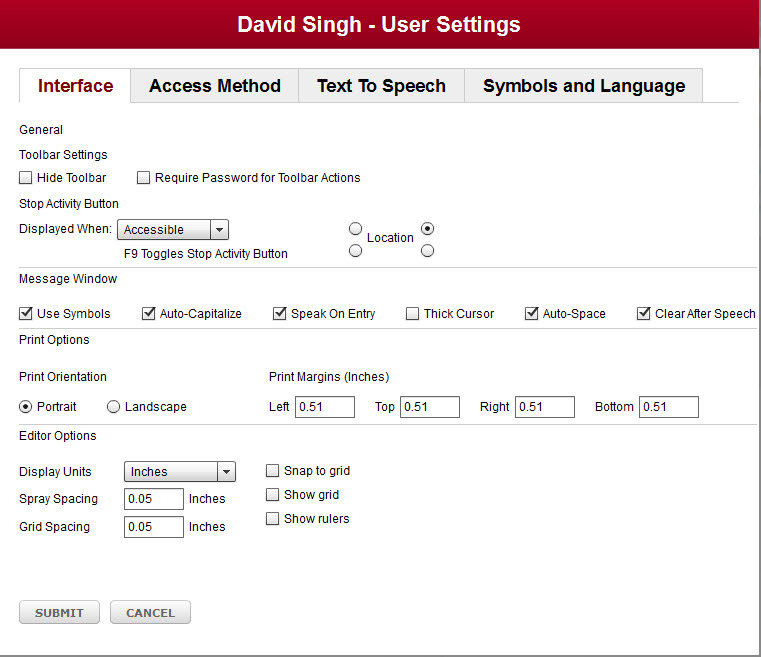 Accessible - Displays a Stop Activity button when the student’s access method is not set to Simple Touch. Never - Never displays a Stop Activity button on any of the activities the student plays. 2. Select one of the Location options to set the button location. Select the radio button representing the top left, top right, bottom right, or bottom left of the page. Use Symbols - Symbolate the message window text. Auto Capitalize - Capitalizes the first word in the message window and the first word in each sentence. Speak on Entry - Text will be spoken as it is entered. Thick Cursor - The cursor will be wider and easier to see. Auto Space - Automatically puts a space between each word in the message window. Choose settings for printing activities. Select Portrait or Landscape under Print Orientation. Use the number fields under Print Margins to enter the left, right, top, and bottom print margins (in inches). Editor options should NOT be changed for the student. When changing the student's user settings, do NOT make any changes to the Editor Options portion of the User Settings dialog.